Mazes are nothing new to even the most casual solver. Whether it’s a puzzle collection, a place mat at a chain restaurant, or a coloring book loaded with time-filling activities, we’ve all traced a path through a maze with pencil, crayon, or marker. But in most paper-and-pencil mazes, we look down on the map from above, so we have the advantage of perspective, the ability to spot dead-ends ahead of time, the opportunity to make wiser choices with more information. As anyone who has ever tackled a corn maze will tell you, maze navigation is far more challenging when you’re inside the puzzle itself, rather than observing it from a bird’s-eye view. 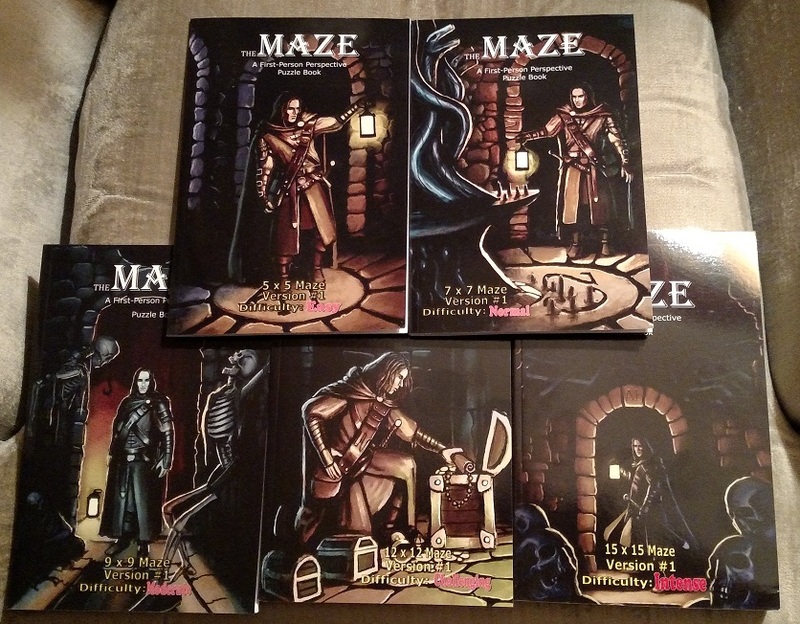 And that’s what makes Brad Hough’s The Maze series of puzzle books something different and far more challenging: they’re mazes designed from the first person perspective. You must imagine yourself walking through this maze, selecting each turn and hoping it will lead you to the promised land. Easy is a grid of 5 rooms by 5 rooms. Normal is a grid of 7×7. Moderate is 9×9, Challenging is 12×12, and Intense is 15×15. As you make your choices, you’ll flip to different pages in the book, just as you would in a Choose Your Own Adventure-style story, maneuvering your way to either a dead-end (forcing you to turn back) or your desired exit. But those are the only decisions you’ll make. There are no monsters to slay or traps to navigate, as there are in labyrinths in Dungeons & Dragons. There are no moral conundrums to unravel, as in Choose Your Own Adventure books. There is simply The Maze… and you. This is bare bones storytelling designed as both a pure puzzle-solving experience and as a blank skeleton upon which you can built your own story. There are no tricks or endless loops to wander into. This is a fair challenge meant to be unraveled by crafty minds with excellent spacial skills. Although The Maze lacks the frills of many other labyrinth-style puzzles, it does a marvelous job of portraying the sort of blindness and trepidation that comes with actually residing within a maze, knowing that each choice is more crucial the farther you venture forth. 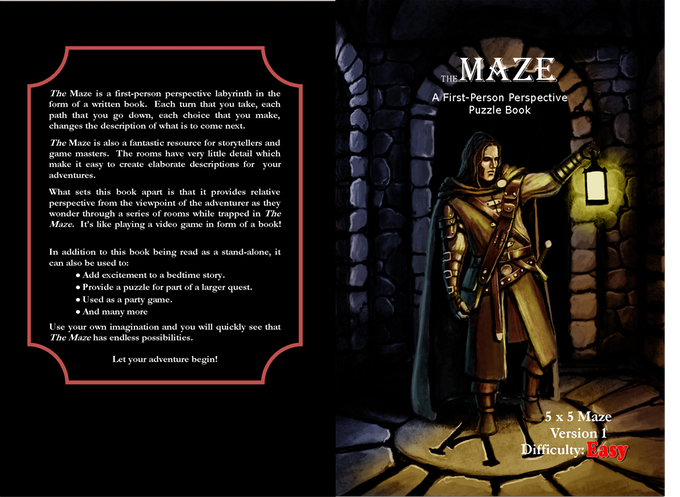 The Maze (in various sizes) is available from Amazon and other online retailers.